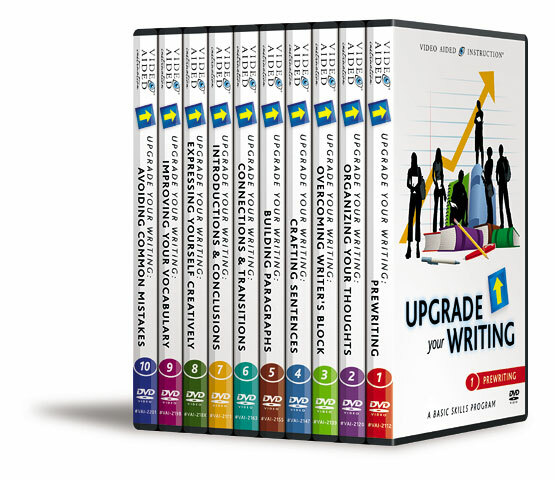 Finally, an easy-to-use resource that helps everyday students dramatically upgrade their everyday writing! 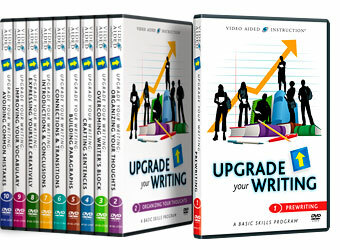 Video Aided Instruction’s Upgrade Your Writing DVD series is like a virtual writing clinic on DVD. It helps middle school students through adults (especially challenged learners requiring remediation) to express themselves more effectively; improve their command of grammar, usage, and mechanics; meet (and exceed) the requirements of their assignments; focus on their purpose and their audience; and develop a writing style that’s smooth, engaging, and truly their own! learning new words by using roots, prefixes, suffixes, context clues, word cards, etc. Now students can avoid the kind of incoherent, disorganized, and error-laden writing that inspires teachers to break out the proverbial red pen: they can finally learn to articulate their ideas effectively and actually upgrade their writing! NOTE: The 10 DVDs in this invaluable series make ideal self-study aids, and they’re also the ultimate resources for educators (teachers, professors, administrators, etc.) who wish to further their own professional development, provide in-service training for their staff members, or supplement and enhance their classroom lessons. succeed in their studies, achieve their goals, improve their lives, & fulfill their dreams!